The Universe - the space around us is filled with endless and inexhaustible energy. It is this universal, pristine, and productive source of power and energy that also keeps us alive. Reiki is a natural healing energy and it flows through the hands of the Reiki channel in a powerful and concentrated form. It can never cause any harm or ill effects. We are all born with this Universal Life ﻿Energy, but as we go through life we become less open ﻿to it. Reiki was rediscovered in Japan in the 19th century by a monk named Dr. Mikao Usui, who found references to it in a 2500 year old Sanskrit document written by one of Buddha's disciples﻿. In the Usui System of Reiki, the Healing Energy is spontaneously and effortlessly transmittedfrom one’s ownbody to another organism, through the touch of hands. Reiki has its own innate intelligence and goes where it is needed. Physical ~ Emotional ~ Mental ~ Spiritual ~ Soul!!! Reiki induces self-healing, strengthens body, mind and soul, opens energy blocks, balances the chakras, rebuilds harmony and flows in unlimited quantity. Reiki is a way to heal minor illnesses, as well as chronic disorders. It reduces stress, provides calmness and inner peace. It is relaxing, quiet and peaceful time for you. Reiki is a gentle hands-on procedure in a sequence of hands positions which cover the whole body﻿. The best way to know of what Reiki is all about is to experience it﻿. The Human Energy Field is composed of the seven auric bodies or layers which are translucent and colorful, appearing much like the colors in a rainbow, only more subtle in intensity. 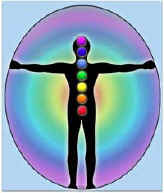 The Auric Body is the Human Energy Field. This energy field is in turn comprised of whirlpools of energy which process and distribute incoming energy as well as release outgoing energy. These whirlpools are referred to as Chakras. 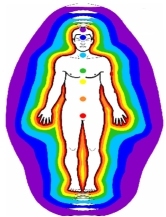 The size of the auric body differs from person to person due to the level of spiritual growth that person is experiencing or the type of awareness they have. It's an energy field that exists while we are alive. The importance of our Aura cannot be ignored as it's in constant exchange with all forms of energy whether man-made or natural. ”One of the most dramatic observations of Reiki is that the Reiki doesn't appear to run out. Reiki practitioners have found that they can continue treating sick people all day and the Reiki will flow just as strongly as when they started the day. Furthermore, the practitioner appears to receive a `spin off' from the Reiki, which means they will finish the day stronger and with more vitality than when they started. This is an observation that differentiates Reiki from other healing systems. Many systems involve the use of the physical energy (chi) of the body as the energy source to use on the patient. This has the effect of draining the physical energy of the practitioner. The overall effectiveness of the treatment is dependent upon the vitality of the practitioner. The number of patients that can be treated in a day depends upon the practitioner's ability to `recharge' his physical energy”.